A short time ago I was talking to a friend, a traditional Catholic, who asked me this question, and I was a bit surprised. It’s not that she’d never heard of it but that she had mostly only heard the name and references to it, without ever having actually heard an explanation. And, of course, being about my age, she had never come across any actual use of the Church’s “other” liturgical practice in the normal course of her parish life. I realised that a person who had never had much contact with the monastic religious who use it (rare in these dark times) could go their whole life never see the Divine Office and could be confused by the profusion of terminology used to describe it. There’s a short answer but it is perhaps deceptive in its simplicity. The Divinum Officium, Divine Office, Opus Dei, Canonical Hours, Liturgy of the Hours… all terms more or less describing the same object, is simply the orderly, regular daily recitation of the Psalms, accompanied by hymns and selected passages of the Bible, all related to the liturgical year and interspersed with shorter intercessory prayers. It could be described as the “other half” of the Church’s universal liturgy, of which the Holy Sacrifice of the Mass is the first and to which it is intimately connected. The two halves express the fullness of a kind of grand and multi-millennial, collective conversation – and means of communion – between God and His saints, taken up and continued generation after generation. The longer answer opens a whole world of mystery. How could this apparently simple thing – the daily recitation or chanting of the Psalms at set intervals throughout the day, organised in such a way that you get through the whole book every week – have ended up creating a kind of new foundation for an entire civilisation, the one you are probably sitting in right now? But it is true; the Divine Office helped the Church to “reboot” classical civilisation as a Christian society of many nations, united by one Faith and one liturgical practice. The Divine Office is the other half of the Church’s public prayer life and we have been chanting some form of the Divine Office since there have been Christians. Yes, but what is it, exactly? In brief, it’s what monks do in response to St. Paul’s exhortation to “pray always” and it is the thing that Gregorian Chant is mostly for. Make no mistake, the Divine Office is at the heart of the monastic life and our civilisation was largely built by monks. Nearly all the institutions we take for granted; law, medicine, natural sciences, agriculture, engineering, architecture, universities, hospitals, the systematic care for the poor, the sick, the elderly, education of children, even intangibles like the ordering of our societies according to a ranking from small towns to local governments, to nation states… all were built on this monastic foundation. Without monks there would simply have been no European civilisation. And without the Divine Office there would have been no monks. The main part, described to me by a Benedictine monk as the “meat of the sandwich,” is the content of the Book of Psalms, which, in the traditional manner of recitation laid out by the Rule of St. Benedict, is sung each week in its entirety. The organisation of which Psalms one chants for a given time of day and for a given liturgical season has a very deep meaning, about “sanctifying time,” and they are not chosen at whim either by the individual monk or the monastery. St. Benedict was one of the first of the great spiritual masters to organise the day around the Psalter and the method of his Rule is still widely observed throughout the Church. The division of the days by the Church into “Canonical Hours” comes from the Roman method of time keeping. When the Apostles were still living in Jerusalem they already had the custom of praying together at midnight, and from this comes the night Office of Matins. Laudes is sung just before dawn, followed by Prime, so named because it is the first Office of the monk’s working day. Terce is usually around nine am, the “third hour” of the Roman business day. Then follows the “little hours” of Sext, the sixth hour at noon, and None, the ninth hour at our three pm. Vespers, the Latin name for evening, is sung between 4:30 and 6 pm depending on the time of year. The last office of the day, Compline, is usually done around 8pm after which monasteries traditionally observe silence until Matins. This cycle of regular prayer times makes up the rhythm of the monastic day, and is called in the Rule the “Opus Dei,” the work of God, and the monk is to “prefer nothing” to it, not work, not sleep or food or any other thing. When the monk hears the bell for the Office, he is to immediately put down his pen or tools and hasten to the chapel for his tryst with Christ. The recitation of the Office in the choir of a large monastic church is an experience like no other and can change your life. If you go to one of the great Benedictine houses of our time, like Fontgombault or Le Barroux in France, where the full Monastic Office is observed, you will see the “classical” arrangement of the monks in choir that has also become the standard since St. Benedict and has formed much of the cultural architecture of our civilisation. At the end of the nave of the church, in the section separated from the public area for the laity and in front of the sanctuary, wooden choir stalls will be set in rows facing each other across the centre aisle. This is the “choir”. A fully professed monk is usually assigned a stall in which he keeps his Office books and personal devotionals and to which he may retire for moments of private prayer throughout the day. At the start of each of the day’s Offices, bells will be rung and the monks will process into the church in pairs, genuflecting together to the Blessed Sacrament then turning and bowing to each other before entering their stalls on either side. When all are assembled the chant begins (except for Matins) with the same prayer; starting with a cantor intoning, “Deus in adiutorium meum intende,” the entire choir responds, “Domine, ad adiuvandum me, festina.” Then all make a profound bow from the waist at the doxology and response: “Gloria Patri et Filio, et Spiritui Sancto. Sicut erat in principio et nunc et semper, et in secula seculorum, amen. ” After this, an “antiphon,” usually a small snippet of the Psalm to be sung, is first intoned and then chanted by the full choir. Then the Psalm itself is chanted “antiphonally,” meaning each verse, divided up into two sections with a pause to breathe in between, is sung alternating between the two sides of the choir. This monastic practice of formal prayer is the main use, outside the Mass, of Gregorian Chant. The antiquity and timelessness of this form of music, and its absolute suitability for the purpose of praise and supplication of the Most High God is probably the reason for the enormous popularity of Gregorian Chant among secular people. It is, in a word, transporting, and once this sublime hint of heavenly reality is tasted, it is almost impossible to continue to ignore or dismiss the culture behind it. Those who participate regularly in it, even in a small way, can never again be content with the assumption that it was merely the hard work and diligence of the post-Imperial monastics that built the infrastructure of medieval European civilisation. In short, it wasn’t the elbow grease; it was the prayer and the response of God to that prayer. Dom Paul Delatte, the second abbot of the monastery of St. Peter’s of Solesmes – the source of the great monastic revival of the late 19th and early 20th centuries – writes in his commentary on the Rule on the distinction between private, personal prayer and the Divine Office. From this we can certainly see why this highly formalised kind of prayer so fell out of favour in the age of guitars and hand-holding, the “charismatic renewal” and the elevation of the “personal relationship with Jesus”. Ours is not a time when the solemn and courtly rituals of the ancient monarchical culture are considered worth reviving. But at the same time, and certainly for a generation of people deliberately deprived of any sense of historical rootedness there is a longing for this kind of connection with the past, with the higher realities and with the cultural identity it grants us. Too many of us have been the victims of this age’s Orwellian attempt to erase our identity and replace it with something small, cheap, false and manufactured. It is, therefore, perhaps not so surprising that an interest in the Divine Office, this most formalised ritual of our Catholic heritage – a survivor of all the ups and downs of 2000 years of our history – is starting to be reconsidered by younger Catholics who feel themselves to have been robbed by our immediate predecessors. The social revolutions of the last century have taken away everything that allowed us to understand who we are. So much has been erased of that ancient Catholic heritage that even a good bishop like Alexander Sample – himself of an age to be a survivor of that revolution – thinks it’s a good idea for young people to turn to Protestants to regain it. It is, in short, the sharing in the action of the heavenly courts. When we participate in the Divine Office and the Sacrifice of the Mass, we are participating in the daily life, as it were, of the saints and angels in heaven. In its Latin sense of “regular” meaning “organised according to a rule.” “Regular clergy” in this sense are priests in religious orders like Dominicans or Benedictines. There are other arrangements that take less or more time to go through all 150 Psalms, but I’m most familiar with the traditional Benedictine arrangement, so will focus on that as a baseline. The private part of prayer is, for Benedictines, “Lectio Divina” (divine reading) in which the Scriptures and writings of the saints are digested slowly and thoughtfully. From this the monk aims at an elevated spiritual state through the stages of Lectio (reading); Meditatio (meditation); Oratio (verbal prayer) and Contemplatio (“contemplation” or “infused prayer”) that leads to union with God. This is the path of holiness that all spiritual writers talk about. From Cassian and Benedict to Teresa and John we know that these two halves of prayer, together with the sacramental life, is the foundation of the process we in the Latin Church call “sanctification” and in the East they refer to as “divinisation,” the project of a lifetime but if entered into fully will turn you into a new kind of person, a saint. 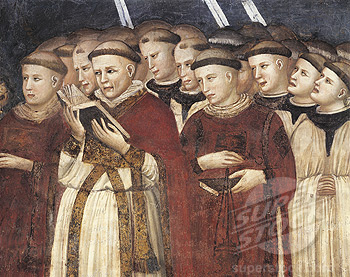 Not only monks but all Catholic clergy are bound by obligation to the daily recitation of the Divine Office, though there is a shorter form for secular clergy produced after the Council of Trent that is more suitable for their non-monastic life. This “Roman Breviary,” promulgated by Pope Pius V was used until Annibale Bugnini created the “revisions” of the liturgy of the Church that gave us the new “Liturgy of the Hours” that most clergy and many of the surviving religious orders use today. Others, more expert than I, have treated of these changes in great detail. There are a few other forms of the Office in the Latin Rite (the eastern churches are another topic) including the Dominican, the Ambrozian – that of the ancient see of Milan – and Mozarabic rites, but they all do more or less the same thing: Psalms, plus hymns, plus short readings and prayers. There is a revised monastic office used by religious adhering to the new post-Vatican II liturgy, but this so fails to interest me that I almost forgot to put it in this footnote. In Benedict’s time and through the Ages of Faith, the first task of a novice monk was to commit the entire book of 150 Psalms to memory by rote – perhaps not quite as hard as it sounds if you’re reciting it all eight times a day every single day. Later his instruction in the Latin language – if necessary – was based on this. A monk’s entire education was organised around the Office and the Scriptures proper to it. We remember this from the opening passages of the Acts of the Apostles on Pentecost. After the Holy Ghost had infused the knowledge of languages in the Apostles, they were accused of being drunk on new wine. But Peter, speaking for the group, refuted this saying, “These men are not drunk as you suppose. It is only the third hour of the day!” that is, about nine in the morning. A detailed description of each of the Canonical Hours of the Divine Office can be found here. But in my opinion, no description of these details can ever be clear until a person has experienced the Office personally. “O God come to my assistance; O Lord make haste to help me,” the prayer most recommended by the pre-Benedict spiritual masters like St. John Cassian. So important was it considered that Benedict adopted it as the opening of every Office of the day. “Glory be to the Father and to the Son and to the Holy Ghost; as it was in the beginning is now and forever, world without end, Amen.” Or, “for ages upon ages,” or “forever and ever”… you get the gist. Or a brief prayer connected to the feast day. Dom Prosper Gueranger, the re-founder of St. Peter’s of Solesmes, nearly single-handedly rescued Benedictine monasticism and Gregorian Chant from the near-oblivion it faced after a century of secularist suppressions. His story is one that will teach Catholics both what we face from a world that hates the Lord and what we ought to be doing about it. Our Italy correspondent is known throughout the English-speaking world as a champion of family and cultural issues. First introduced by our allies and friends at the incomparable LifeSiteNews.com, Miss White lives in Norcia, Italy.